Many businesses spend a lot of time on marketing. But only a little time or effort on customer referrals. Sometimes they think it’s just too difficult. Check out our other articles in this part of the toolkit if that’s you. Sometimes they don’t see the value. Read on if that’s you! If you are not sure about the value of referrals, here are some statistics that may make you have a rethink! This is from a piece of research looking into the sources of sales across a wide range of businesses. Positive proof that referrals are an effective way to generate business! This consumer research shows the power of referrals. Rather than spending money getting new customers to trust you, get your customers to do it for you! From the same piece of research. It shows the impact of getting a recommendation from someone you know and trust. You are much more likely to take action than if you receive it from someone you don’t know or trust! An interesting piece of research looking at how to incentivise referrals. 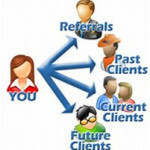 People are happy to gain by making a referral, but look for value not just money. Some see offering money to be the same as offering a bribe so they are suspicious! This backs up the research from the University of Chicago. People don’t make a referral for a financial reward. They want to help someone or want to be someone who has knowledge others want. I think this shows 2 things. First, most people are happy to make referrals (so get off the fence and start asking for them!). Second, most need some sort of help to start. That can be some sort of incentive, an easy process or just asking!